Sewer Rooter Service - $59 Rooter & Plumbing Service in Phoenix, AZ provides residential plumbing and repair services. Welcome to the $59 Rooter & Plumbing Service SEWER ROOTER page. We have specialized in sewer rooters since 1992 when we started out with an old fashioned Spartan spool style sewer cleaning machine. To haul that big monster up on the roof and clear up to 75 feet of a residential sewer system was quite a labor intensive job. A lot has changed since 1992, the cost of living is triple what it was back then. Even though our price for sewer cleaning has increased we still take pride in the fact that our prices are about half what our major competitors charge for the same job. In fact we consider ourselves “The half price Plumbers” on all rooter and repair work that we do. Over the past 22 years we have cleaned, repaired, or replaced thousands of residential sewer lines for homeowners all over the greater Phoenix area. Even after all these years we still continue to specialize in taking care of sewer lines for our customers. We have evolved in such a way that we always have up to date, state of the art Ridged equipment on our trucks so as to be prepared to handle any residential sewer job that comes our way in the most professional way possible. Our Ridged K-60 sectional sewer cleaning machine can rooter up to 250 feet into any 4 inch residential sewer line and we have an assortment of cutting tools to cut through nasty root intrusion or blockage that may be stopping flow in the sewer system. The best remedy for a stopped sewer system is to call a Plumber you can trust and depend on to do the job the right way. On those rare occasions when the Ridged K-60 sewer cleaning machine will not penetrate a stopped sewer line we will resort to the use of our state of the art Ridged See Snake that is equipped with a built in camera lens and a locator beacon that will give us an exact image and location of the problem that is causing the blockage in the sewer system. A big offender is the tree that has become so huge that it overpowers and breaks the sewer line in such a way that it needs to be repaired at the location of the breakage. 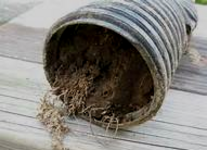 We have repaired numerous sewer lines that tree roots have damaged, and a professionally repaired sewer line can be expected to last 20, 30, or even 50 years longer than it may otherwise last. Before the 1970’s when plastics became the industry standard for sewer & drain lines, many sewer system installations were done with the dreaded “Orangeburg” pipe materials that proved to be an inferior product over time. Its a tar paper type material that had its manufacture origins in Orangeburg NY. And so it came to be known as orangeburg pipe, the dreaded sewer pipe material that becomes mashed down (or even flat) over time and requires multiple repairs or even complete replacement. $59 Rooter Services Will Promise You a Job Well Done! And of course the not to be forgotten and most common cause of all sewer line problems is human error such as flushing feminine hygiene products or the using of the worst offender, Drano products. Yes that’s right, habitual use of Drano products have destroyed many sewer systems that would have otherwise lasted 100 years without having any problems whatsoever. So in the end, when there is a plumbing problem at home find a plumber who is honest and will charge a fair price and let the professionals handle that plumbing situation, especially those sewer line issues that require rooter, repair or replacement.